You are here: Home / News / Eureka! Jonny experienced that Eureka moment at Sarno when he won the European Championship opener with 25 yards to spare. 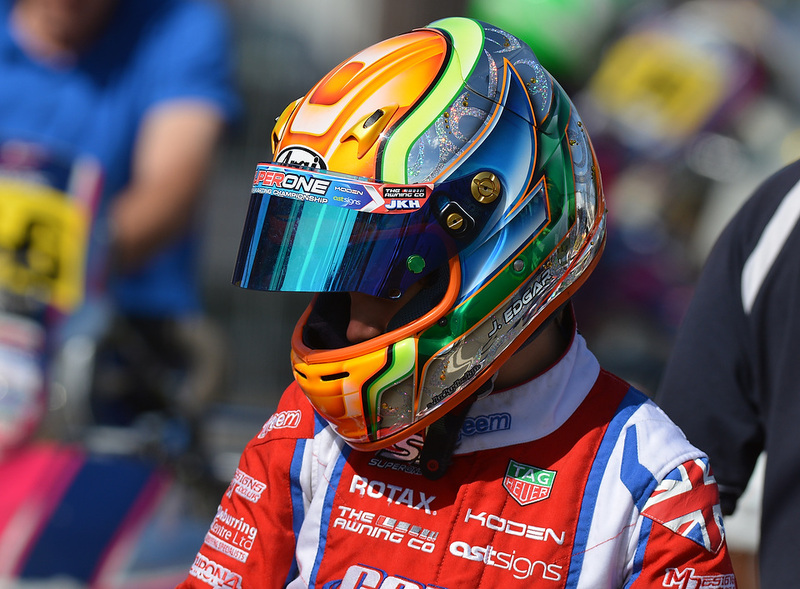 It was a special moment to savour for his grandfather, Terry Edgar, who had been celebrating his 70th birthday at home in Rowrah. “It’s the best birthday present I could have wished for,” exclaimed Terry after watching the race on live television. However, it was the stricken Billy Monger who occupied Jonny’s thoughts when he talked about his victory from the podium afterwards. Whilst still in karting, Billy came under the wing of Forza team manager Jamie Croxford. 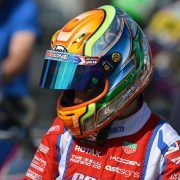 As just about everyone in the sport will know be aware, he was involved in a horrendous F4 accident at Donington Park a week earlier and had both legs amputated. Sad though this news undoubtedly was, the Forza team had to concentrate hard from Thursday onwards, as it became clear that Jonny would face intense competition. He recorded the quickest lap times in all of his free practice sessions, but received a slight set-back during Saturday morning’s timed qualifying session. Jonny’s group was first out on the circuit and lap times were consequently slower than other sessions held under more favourable conditions. Even so, he managed to qualify 6th overall. After taking an early lead in his opening heat, Jonny hit some small stones that had been thrown up onto the circuit by a backmarker. It caused his kart to go into a half spin and, although he recovered well, this incident cost him the race victory that went, instead, to Germany’s O’Neill Muth. He had to settle for another 2nd place finish behind Brazilian driver Gabriel Bortoleto in the next one. Jonny made no mistakes in Heat 3, winning by a margin of 20 yards or so from Italy’s Luigi Coluccio. By winning his 4th heat on Sunday morning ahead of Muth, Jonny was guaranteed a front row starting slot for the Final. However, it was Bortoleto who occupied pole position after claiming his third victory from four heats. Zak O’Sullivan and Harry Thompson were placed on row 2 ahead of Coluccio and Leonardo Marseglia. Clearly, the final would be a hard fought affair. From the lights, Jonny tucked in closely behind Bortoleto and overtook him halfway around lap 1. Thompson went through into 2nd place but gradually began to lose ground. At the quarter distance mark Bortoleto regained 2nd spot but by this stage Jonny had pulled some 30 yards ahead. By half distance, this gap had barely altered, although Muth was now lying 3rd ahead of Thompson and O’Sullivan. Bortoleto managed to gain a few yards over the last two or three laps, but Jonny still came home a comfortable winner. http://www.jonnyedgar.co.uk/wp-content/uploads/2016/09/Jonny-Edgar_8497_web.jpg 707 960 Admin http://www.jonnyedgar.co.uk/wp-content/uploads/2016/02/Logo_340x180_Colour-300x159.jpg Admin2017-04-24 11:31:202018-02-19 16:24:44Eureka! Stunning at Sarno Double Deutsch!